The latest of media group NDTV's barrage of alliances with online portals is classifieds site GETIT Infoservices Pvt Ltd, which is powering sections of the news site NDTV.com. Getit FreeAds and Getit.in will power the classifieds and the local search section of NDTV.com respectively. Suparna Singh, Deputy CEO, NDTV Convergence Ltd, said, "We want to make NDTV.com the one-stop home for credible and reliable information across genres. Our partnership with Getit Infoservices Pvt. Ltd. is a big step for us. The classifieds and local searches on offer should help extend surfers' engagement with us in an exciting new space." NDTV Classifieds sports a Beta tag. The local search is not in the main categories and is instead incorporated as a widget in the right hand column under Featured Services - Local Search, which then opens out to NDTVLocalSearch.Getit.in. NDTV's other alliances include - Hungama (NDTV Music), Reliance Entertainment owned Zapak (NDTV Games), Infibeam (NDTV Shopping), Indiamart (NDTV SME), Consim Info's IndiaProperty (NDTV Property), Shaadi.com (NDTV Matrimonials), Myngle (NDTV Tutor), Carwale (NDTV Auto) and BankBazaar.com (NDTV Money). The New Delhi headquartered Getit claims it has served over 10 million customers through Freeads. Getit.in currently reaches 30 cities in India and has a mobile WAP site M.Getit.in and an SMS app serving over a million local businesses. Besides these two initiatives, Getit also has a B2B marketplace called Tradeget.com which is still in Beta. Tradeget connects national and international distributors, exporters, suppliers, manufacturers and service providers online. Sidharth Gupta, CEO, GETIT Infoservices Pvt. 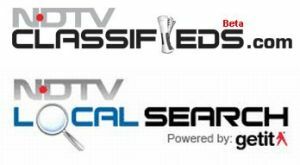 Ltd. said, "The combination of the NDTV news brand and Getit's free classifieds and local search should be able to unlock significant value for NDTV and Getit. We have embarked upon a huge alliancing program across various publishers which will bring good advantage to both, the alliance partner and ourselves. This integration of directional media is going to serve partners and customers with additional informational services."